The convenience of fast student loans will typically end up costing you more in interest rates, fees and other expenses. Most loans that are financed very quickly will have high penalties as well. However, due to the size of most student loans, choosing convenience over cost presents an even greater expense with these loans than with others. The main way people go about securing very fast loan approval is through the Internet. Nearly every bank now offers the option to apply for accounts, credit cards and even loans online. There are other non-traditional lenders that additionally have an online presence. When you are applying this way, you will not likely have to visit the branch of the lender at all. Because you do not have to go through a lengthy in-person application process, you can shop around for loans. You will be able to get multiple quotes within a day's work. The quotes will also be turned around rather quickly. These fast loan options are also notorious for guaranteeing approval to a wide range of applicants. They will typically provide most people with financing options, and the main difference will be the interest and limits extended to each. Those borrowers who have less than perfect credit or low incomes may find it easier to qualify through this method. As long as you do not have a bankruptcy or recent default on record, you should receive at least one loan offer through a fast loan lender. Lenders work the same way most insurance companies, cell phone companies, computer stores and other retailers work: if you want convenience, you will have to pay for it. It is cheaper for lenders to set high loan standards and take time in sourcing your loans. This would result in fewer defaults, less modifications in the future and less hassle for the lender. However, you are mostly concerned with hassle to you. As such, the lender must take a route that will lead to likely worse circumstances, funding a loan very quickly and not verifying all of your documents. To compensate for the high risk they are assuming, lenders will ask each borrower to pay more. The chances of needing a fast student loan are rate because you will know well in advance how much money you need to attend college or graduate school. Your school will not likely rescind your acceptance if you need some time to arrange that financing. Unlike a home loan, where there is a commodity that must be purchased at an opportune time, a student loan gives you more flexibility to shop around. So, shop around. 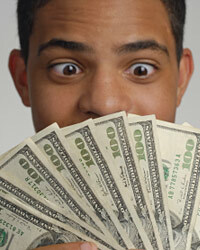 Look for options through federal loan programs and your college financial aid office to get a better deal. Waiting until the last minute and then accepting a high interest rate will only cost you money in the long run.